This year marks the 4th annual Holiday Anchor-Out Gift Bags project—an initiative launched in 2014 by husband and wife team Carolyn and Chad Carvey, in partnership with the Sausalito Lions Club and Christ Episcopal Church, with the support of local shops and organizations. This is the first year the Carveys have made a public appeal, with a NextDoor post: Share some love with our Sausalito Anchor Out Neighbors this Holiday Season! and now here again in the Floating Times. Each year friends and the (above-named) partners donate funds towards items such as solar powered devices and dry bags, useful for those living on the water and without electricity—along with cookies and sweets to bring holiday cheer. The highlight of the first year—solar-powered multi-colored LED holiday lights—managed to do both. Intervening years have featured various solar-charging panels and lights, capable of charging cell phones and other small devices. This year’s centerpiece gift is a secret, though we can reveal the Carveys were able to obtain the $60 item for $17. Last year Carolyn and Chad spent several days at Christ Church baking cookies and sweet treats. If you and/or a few friends would like to bake, make—or buy—something, the magic number is 110, as there are 110 gift bags to fill. Baked goods (bought or made), gloves, socks, caps, certificates, cards, LED anything, small tools and handy things for boat life are all appreciated. Cash donations are also an option, again in multiples of 110: $110, $220, and so on—the Carveys will buy/add something in your name. PLEASE contact Chad with your idea, before you do anything to be sure it works with the bag this year. Chad and Carolyn Carvey—SV “Walk On”—415-246-9838 — chadvoyage@yahoo.com. The current date and place to stuff the gift bags is Monday December 4 at Christ Episcopal Church, Sausalito—bags to be delivered December 8 and 9. Contact the Carveys if you’d like to help stuff bags. Baked goods should be able to last through to the delivery date. 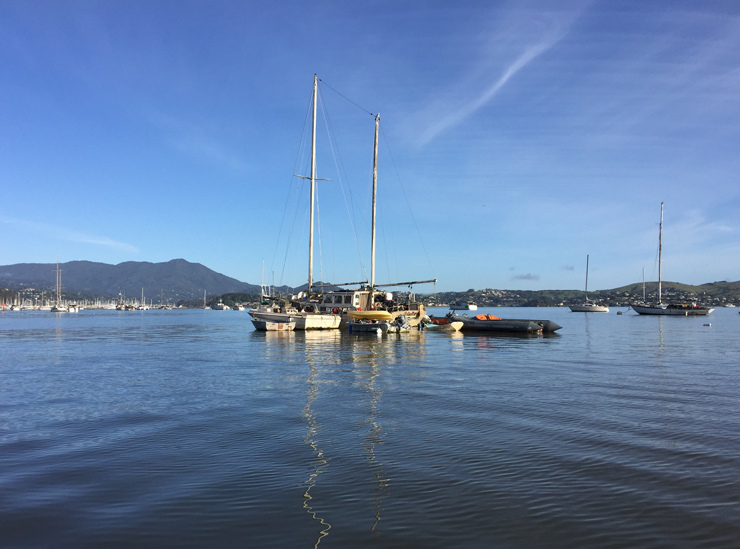 The Carveys, who themselves live on the water, as they fix up their boat for a ’round the world voyage, are motivated by what they see as “a deep and growing divide between many of the folks living at anchor, out on the waters of Sausalito, and their neighbors living on land and in floating homes.” They see this project as a way for the “land-based neighbors and businesses to send a holiday hug to all our salty brothers and sisters” out on the water.